Trace minerals are normally recycled so they only required in tiny amounts, but if the kidneys become hyperactive, vital minerals can be lost. Of course, deficiencies also occur because of the lower quality of food grown in depleted soil. Some minerals are essential so supplements can be used to compensate for loss or deficiency. The best supplements are the ones that include all the minerals that are natural. These can come from pristine areas of the Planet, fossilized sea vegetables, or sometimes from volcanic ash. 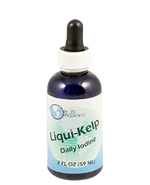 Kelp (Fucus Vesiculosus) is one of the best sources of Iodine making it a good treatment for hypothyroidism, obesity, adrenal insufficiencies, energy and endocrine gland disorders. Contains: Does Not Contain: Sugar, starch, yeast, corn, wheat, milk, artificial color or flavor. Special Pet Formula combines a base of MEZOTRACE® Natural Minerals & Trace Elements with the highest quality B-complex Vitamins, as found in pure brewers yeast, as well as added Thiamine and Vitamin E.
Contains: Mezotrace Minerals, Torula Yeast (Inactive), Thiamin HCI, Silica and Natural d,Alpha-Tocopheryl Succinate (Vitamin E). Additionally, Special Dog Formula contains the following Trace Elements (micronutrients), as associated in a unique, 100% Natural marine sedimentary mineral deposit containing varying naturally occurring combinations and amounts of: Bismuth, Boron, Bromine, Chlorine, Cobalt, Flourine, Gallium, Germanium, Gold, Hydrogen, Lithium, Nitrogen, Silver, Strontium, Tin, Tungsten, Vanadium, Zirconium. 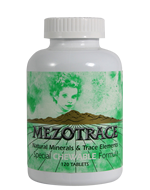 Contains: MezotraceÂ® Calcium/Magnesium Natural Minerals & Trace Elements with Iron, Zinc, Copper, Selenium, Manganese, Chromium, Molybdenum, Sodium, Potassium, Iodine, Bismuth, Boron, Bromine, Chlorine, Cobalt, Fluoride, Gallium, Germanium, Gold, Hydrogen, Lithium, Nitrogen, Silver, Strontium, Sulfur, Tin, Tungsten, Vanadium, Zirconium. Willard Water is activated by a catalyst that makes the micronutrients from lignite easier to assimilate. These micronutrients are millions of years old and are helpful for those with serious deficiency issues. This dark Willard Water is concentrated and when added to water as directed is practically tasteless. Contains: 16 oz. of catalyst activated water with traces of organic lignites.